The labeling of textile products harmonizes the names of textile fibers and other terms used in labeling or other documents accompanying these products, in order to ensure adequate information for consumers and to promote the development of the market. textiles forming a part of other products where the textile parts are specified. All items must carry a label indicating the fiber content either on the item or the packaging. This label does not have to be permanently attached to the garment and may be removable. If the product is supplied to a wholesaler, the indication may be contained within business documents (e.g. the invoice). A textile product consisting of two or more fibers accounting for 85% of the finished product should be marked with the fiber followed by a percentage, e.g. Cotton 80% Polyester 15% Nylon 5%. If a product consists of two or more components with different fiber contents, e.g. a jacket with a lining, the content of each must be shown. Any decorative matter that makes up 7% or less of the product is excluded from the indication of fiber content. The word ‘pure’ should only be used where the garment is made up of only one fiber. The word ‘silk’ cannot be used to describe the texture of any other fibre; e.g. ‘silk acetate’ is not permitted. Only certain names can be used for textile fibres. 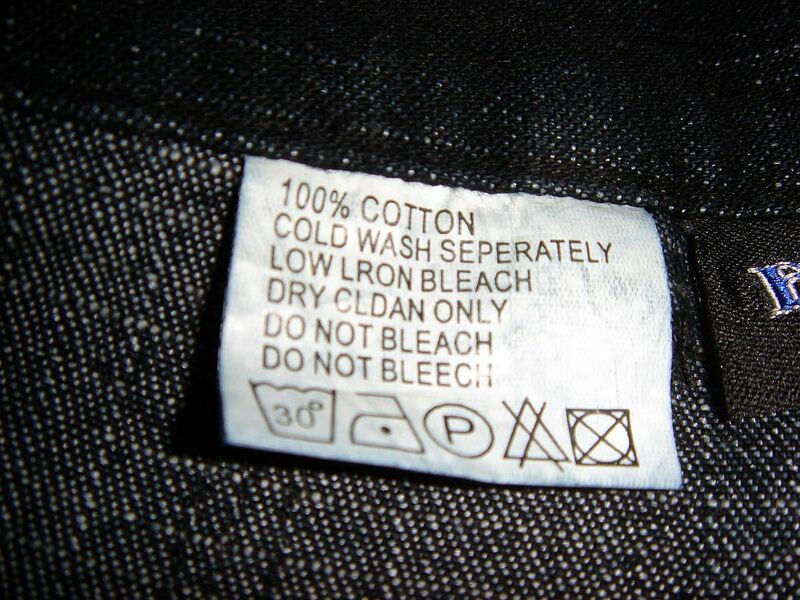 Textile products must be labelled or marked whenever they are put onto the market for production or commercial purposes. Where these products are not being offered for sale to the end consumer, or when they are being delivered in performance of an order placed by the State, labelling or marking may be replaced by accompanying commercial documents. The names, descriptions, and details of textile fibre content must be indicated in these commercial documents. They must also be indicated on products offered for sale to consumers. With the exception of trademarks or the name of the undertaking, information other than that required by this Directive must be quite separate. Member States may require that their national language is used for the labelling and marking required by the Directive. A textile product composed of two or more components which have different compositions must bear a label stating the fibre content of each component. Where two or more textile products have the same composition and form a single unit, they need to bear only one label. The Directive makes provision for derogations for the labelling of certain textile products. The manufacturer will use symbols on the label to inform the consumer and promote sales. The consumer, however, has the responsibility to use and care for the product as instructed on the labelling. The British Standards Institute (BSI) tests products and the process by which they are made. If the product is of the required standards then the manufacturer can display the BSI Kitemark on the product labelling. Consumers trust that products bearing the Kitemark have passed a rigorous certification process and will not only be safe to use but will also be fit for the purpose for which they were designed. The CE marking is a mandatory European marking for textile products, such as those for children. The symbol shows that the essential health and safety requirements set out in European Directives have been met. Companies may add their name and logo to the label along with a certification trademark, such as the Woolmark. This type of trademark can be used under licence, providing the product meets agreed quality standards. A designer must consider the needs of the target market and it is essential that a safe product is developed. The manufacturer and retailer will be required to abide by laws that are in place to protect the consumer. If the product is for a child, sharp or small parts that will come off when chewed or pulled, or long ribbons and cords, cannot be included as they might injure or choke the child. Children’s nightwear must be labelled: “Keep away from Children”. It is the designer’s responsibility to ensure that appropriate fabrics, components and textile processes are used and that health and safety issues are taken into consideration. New fabrics and fabric finishes might be selected by a designer to ensure that a product is safe and appealing to the consumer. Fabric that is hypoallergenic with UV protection may be chosen, such as that made from bamboo. Bamboo’s organic and natural fibre properties make it non-irritating to the skin for anyone with skin sensitivities or allergies. Wool, alpaca, llama, camel, cashmere, mohair, angora, vicuna, yak, guanaco, cashgora, beaver, otter, whether followed or not by the name ‘wool’ or ‘hair’. Animal or horsehair with or without an indication of the kind of animal. Silk, cotton, kapok, flax or linen, hemp, jute, abaca, alfa, coir. Polyurethane, vinylal, trivinyl, elastodiene, elastane, glass fibre, broom, ramie, sisal, sunn, henequen, maguey. Acetate, alginate, cupro, modal, protein, triacetate, viscose. Acrylic, chlorofibre, fluorofibre, modacrylic, polyamide or nylon, aramid, polyamide, lyocell, polylactide, polyester, polyethylene, polypropylene, polycarbamide, elastomulltiester. Name corresponding to the material from which fibers are composed, e.g. metal (metallic), asbestos, paper, followed or not by the word ‘yarn’ or ‘fiber’. Air supported structures, animal clothing, artificial flowers, book covers, buttons and buckles, cordage, rope & string, disposable articles, egg cosies, felt hats, felts, flags and banners, funeral articles, gaiters, labels and badges, make up cases, muffs, old made up textile products, oven gloves, packagings (not new and sold as such, e.g. used potato sacks), painted canvas, pin cushions, protective prerequisites of sport, purses, pouches, bags & saddlery, safety items, sails, shoe cleaning cases, sleeve protectors, sleeve supporting armbands, slide fasteners, spectacle, cigarette and cigar, lighter and comb cases, stuffed pan holders, table mats having several components and a surface area not exceeding 500 cm2, tapestries, tea and coffee cosies, textile parts of footwear (except warm linings), textile products for base and interlining fabrics and stiffening, tobacco pouches, toilet cases, toys, travel goods, watch straps.